​I always get up early on the morning of a big event and the Melbourne Marathon certainly qualifies as such. It gives me time to get plenty of fuel in, loosen up and make sure none of my race day preparations are rushed. Seeing as I had travelled, I thought I was a sneaky chance of Luke Beveridge shouting me breakfast, but he must have still been in bed so I made do with my own. The start line for the race was awash with people. The level of activity and energy from the moment I got there twenty minutes before the race was incredible. Thankfully there were marshalling flags and pacers with balloons to try to organise the thousands of runners so that the quicker runners are at the front and the slower ones at the back. I really like the way the group of runners who have run every Melbourne Marathon get a special starting point ahead of the main group. It is a lovely touch of respect to veteran athletes and maybe something that the North Melbourne Footy Club could learn a lot from. The race started and the waiting mass of runners surged forward. This is always the hardest part of a run (until the end, which is also the hardest part) because despite the indicators I mentioned, a lot of people still find themselves too far forwards and become obstacles for quicker runners behind them. Getting caught in the wrong place at the wrong time can be a real problem (just ask Harambe the gorilla), so I usually try to start pretty hard and get away from the congestion. No luck today though- I was cutting left and right across the Flinders Street quicker than Frogger on the hardest difficulty setting. 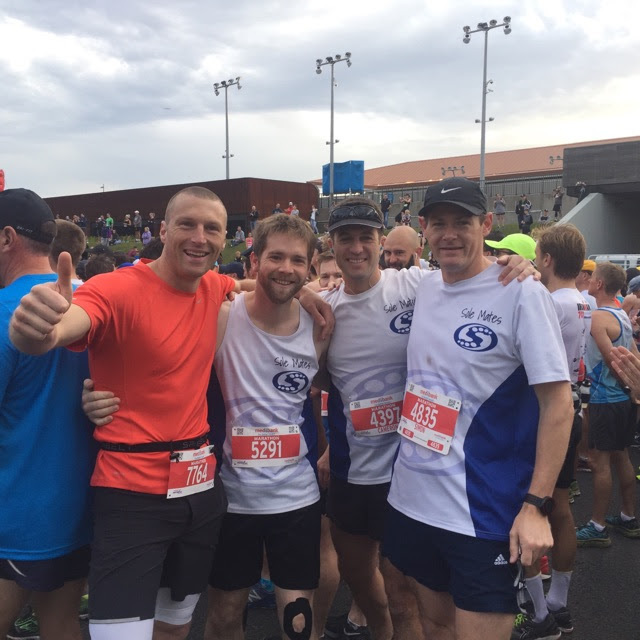 When we crossed the Swanston Street Bridge, it was still crowded but getting easier to keep a steady pace and it was only another couple of kilometres until we were running pretty comfortably. 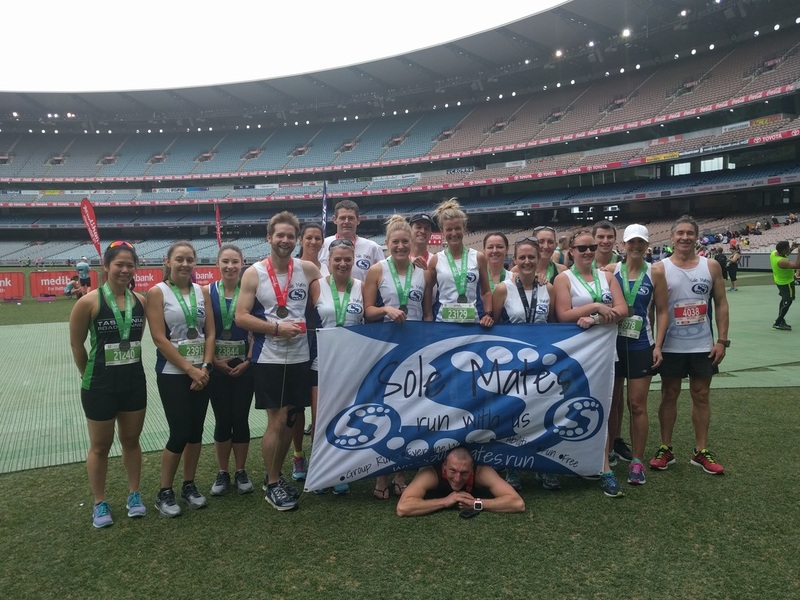 I was lucky enough to be running with a group of friends from the Solemates Running Group. Simon, Will and Cam were all planning on running a similar time to me so we stayed together for much of the first twenty kilometres chatting and encouraging each other. With the breeze on our back and plenty of enthusiasm we motored down St Kilda Road a little ahead of our target speed, before turning right and then right again into Albert Park. After giving myself a mental upper cut, I managed to stop thinking about this and push on. After a few twists and turns, we were heading back out of the park the same way we had come in and making our way down a gentle slope towards the sea. We hit the water and turned right, running up towards Port Melbourne on a stretch of the course that is straighter than Bob Katter claims his electorate to be. After a few more kilometres, the turnaround point gradually materialised in the far distance, near the resting Spirit of Tasmania ferry. Now ordinarily I’m as good at pacing as Donald Trump is at debating so to begin with, I had no idea whether I had gone out too hard, too slow or just right. As it turned out, I was just about right (which somewhat fittingly makes me the Baby Bear of marathons). After turning around, we hit the half marathon point just under our target time and I was starting to feel a bit more optimistic, as my blisters and niggles weren’t getting a whole lot worse. Cam and Simon had got separated from us, but Will and I were cruising along pretty happily. ​My spirits had risen particularly when the wonderful volunteers at the drinks stations (who I can't express enough appreciation for) had started giving out bananas and I was cheerfully eating as I ran. Obviously I couldn’t just throw the peels away though, as I have seen plenty of Warner Brothers cartoons and I know how dangerous they can be. As a result, I spent so much of this event carrying banana peels I could have been playing Mario Kart. I really like the Melbourne course. I recently ran the Ross Marathon which was a four lap course and while repetitive things aren’t always bad (just ask Taylor Swift fans), I do like the fact that the Melbourne course is a single loop. We passed Fitzroy Street not long after the half marathon point and then continued to keep the water on our right as we headed out into St Kilda. After another few kilometres we finally did another sharp U-turn and began the journey home. ​While not as bad as forecast, there was some strong wind on the course and it pushed back against us like the Australian Christian Lobby resisting ideas of decency and equality. It was probably at its strongest coming out of St Kilda and we really had to lean into it and fight hard to maintain our speed. The race had spread out a fair bit too by now so there were less runners bunched in front to provide much cover from the wind. I managed to avoid a couple of blasts by tucking close behind a helpful runner in front, but for the most part you just had to battle through it and try not to lose too much speed or energy. After nearly thirty kilometres, I finally turned away from the water and began the gentle climb back to St Kilda Road. I had to admit to myself that I was feeling pretty good and that if I pushed myself a PB was a definite likelihood for the race. I picked up speed and realised I was now going faster than a lot of people ahead of me. Having people in front to catch up to is always an extra little incentive in a long race even if you can’t catch ‘em all (they’re not pokemon after all). The road became suddenly crowded towards the top, as we were joined by half marathon runners exiting Albert Park, but once we were onto St Kilda road we were separated again, which made it a lot easier. Keeping an elevated pace for the long stretch of St Kilda Road was starting to hurt, but I figured I had enough energy to make it to the end without slowing much. At this point my sole purpose became staying above a certain speed, so I basically became just a better looking version of Keanu Reeves in the movie Speed (although thankfully I didn’t have to talk to Sandra Bullock). As we approached the Yarra, the course veered left and curved back around under the bridge. 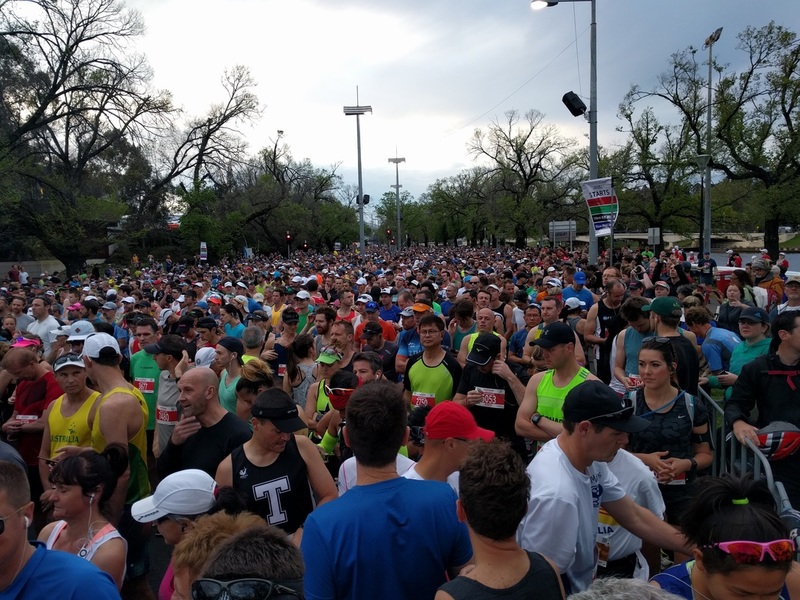 Even without a troll or Anthony Kiedis, it was pretty crowded under that bridge, with runners from both the half and full marathons converging in the narrow darker space. Everyone was pretty careful when I went through and I didn't see any collisions and soon enough we were separating again (the two courses get together and separate as regularly as Ross and Rachel from Friends) with the marathon course heading up the hill on the Tan. The hill wasn’t actually as bad as I remembered and I went past the War Memorial still feeling pretty good. I could feel I was closing in on the end as I ran away from the Tan and I was still ahead of my target speed. I might have got a bit carried away, because a few minutes later, as I re-crossed the Swanston Street Bridge, I could feel my energy drop away like Chris Uhlmann’s credibility. Despite the fact that I was only a few kilometres from the end and I could see the MCG, I was starting to question myself as to whether I could hold my pace all the way. I was really grateful for some words of encouragement from another runner who appeared beside me and used it to push myself into a final burst of energy. ​I slowly got faster and faster as I closed in on the final turn into Jolimont Street and by the time I was running under the footbridge, I was going as fast as at any point in the race! 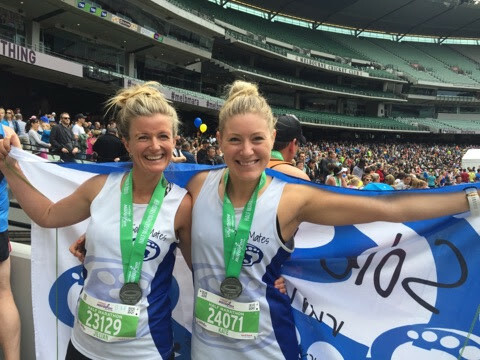 I shouted aloud with excitement as I ran through the race and out onto the grass of the MCG. There were thousands of people making heaps of noise, but they were drowned out when I got half way around and my friend Jill (also known as Mama Bear) started shouting at me. I gave a quick wave and ran on to the finish line (click here to go to full results). It was only a few minutes before Will arrived behind me, running with Jarred, another Solemate. The three of us made our way towards the exit where we met more of the Solemates family who were waiting for us. After some congratulatory exchanges I headed down the race, collected my medal and made the most of a complimentary post-match massages. As my muscles were now tighter than Christian Porter’s welfare policies, I was writhing around on the table a bit, but I figure a massage that hasn’t hurt much hasn’t done much so I could gratefully confirm this one did plenty. I imagined there were some public change-rooms somewhere, but didn’t want to be part of any locker room talk (Donald Trump tells me it gets pretty unpleasant), so I just stayed in my running gear and basked in the warm sunshine, the satisfying feeling of accomplishment and the unmistakable presence of good friends. ​That was an amazing event and a pretty epic day- and it wasn’t even lunchtime yet! The entire weekend was pretty amazing, but that is another story.